Have you guys ever played that game where all the animals in the world disappear and you can only eat one kind of meat for the rest of your life? (I know this isn’t relevant to all those non-meat eaters out there, so I apologize in advance!) I always, always, always end up choosing chicken. I LOVE chicken. Plus, bonus: eggs! But then I start thinking about it and I get really sad when I realize that I’ll never get to eat cheese again (the horror!) or bacon (so tragic). So basically, I can never choose. Seriously though, I am in love with chicken. I even like eating it straight up plain with just salt and pepper. 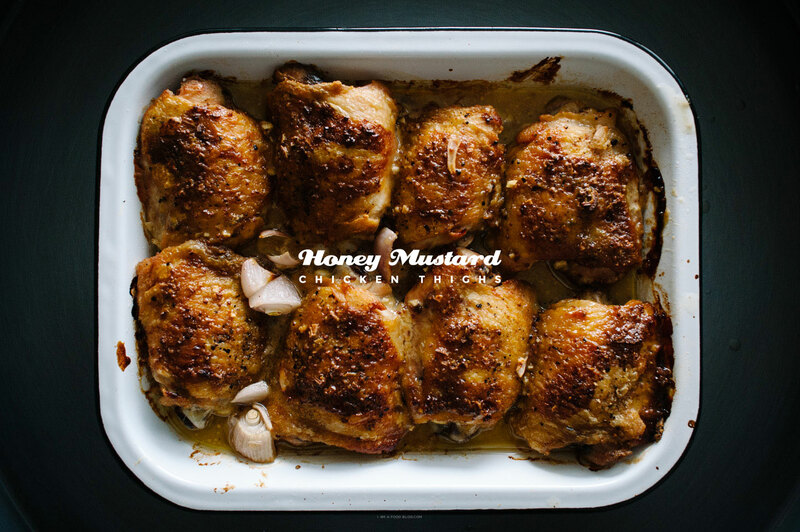 If you’re not into plain, try out this super simple honey mustard chicken! It’s slightly sweet, mustardy and super juicy. Truth: I always choose honey mustard dipping sauce when I have a choice. There’s something about the heat and sweet. It’s the best sauce out there for dipping. And it’s even better when chicken is just straight up baked in it. This is a pretty simple recipe without a lot of ingredients. 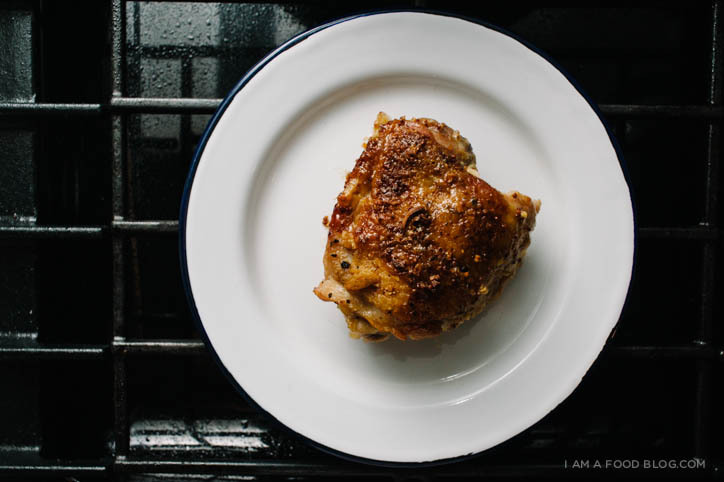 Chicken thighs are the most forgiving of meats — they’re always juicy and incredibly hard to over cook. I love chicken breasts too, but if I had to choose, it’s chicken thighs thighs all the way. And really, I don’t get the whole drumstick thing. I’m not a huge drumstick fan. Oh, I almost forgot, which meat would you choose if all other meats were to cease to exist? In a small bowl or glass measuring cup, whisk together the honey, whole grain mustard, dijon, and garlic. Taste and season with salt and pepper. Pat the thighs dry with a paper towel and season generously with salt and pepper. Heat up a large cast iron pan or non-stick skillet on medium high heat and add 4 of the thighs skin side down. Brown for 5 minutes undisturbed until golden and crispy. Remove from the pan and place in a large oven-proof casserole dish. Brown the remaining 4 thighs and place in the oven-proof dish. Top with the quartered shallots and pour on the honey mustard mixture. 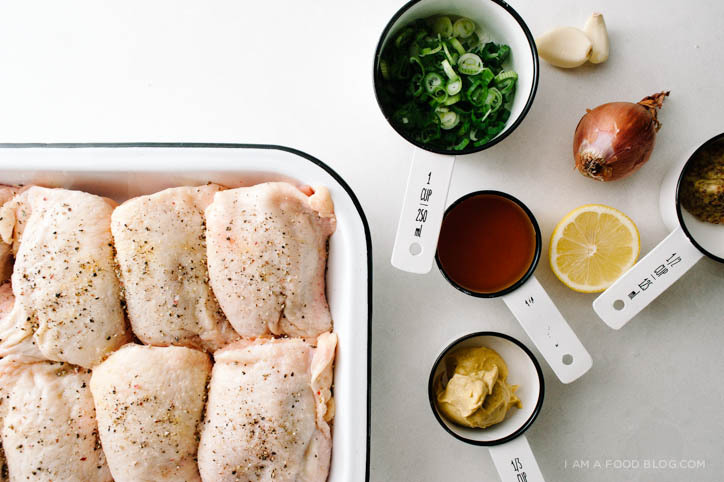 Bake until the thighs are cooked through, 30-40 minutes based on size. Squeeze on some lemon juice (adds some brightness) and sprinkle with green onions (adds some freshness) if desired and enjoy warm! Ha, that’s one of those nightmare scenarios us food addicts agonise over, isn’t it? And normal people think we’re a bit special to even worry about it for a second? Sometimes I think I’d choose chicken too, because it’s so darn versatile and as you say, eggs… eggs are just such a core food aren’t they. I don’t really like breast meat, but my husband does. I’m a thigh girl all the way. Drumsticks only get eaten because we usually buy a whole bird so it’d be a waste not to! But often go into risotto or soup or chicken pasta bakes. On the other hand, pigs would give me pork, bacon and sausages. Now I actually don’t eat much regular pork but I bloody love sausages and bacon. But even then, I’d probably not choose pork. Cows are high on the list not just because I love beef because cheese is probably my favourite non-meat foodstuff. I adore it and couldn’t imagine living without it. I could countenance swapping cow for goat or sheep, as there are fabulous cheese made from all of these. But yeah, I need cheese. And yoghurt! Not so fussed about milk at all. Sheep, well I adore lamb too and they’d be an alternative option to the cows for meat and dairy and may be easier to feed for a non-farmer. By the way, yes too to honey and mustard, a favourite combo here too. Oh, gosh. My husband would definitely choose pork…and while I love chicken (and a life w/o eggs would be damn sad), I don’t know if I could give up beef and dairy. This scenario is a real tragedy for me. This chicken looks amazing though, and a world without crispy chicken skin would be a damn shame. Chicken is definitely my favorite.. 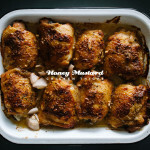 This recipe looks so amazing.. Honey mustard is one of my favorite flavor combinations on chicken. On anything really..
Oh dear that sounds like a bit of a horrible game, but my meat of choice to NOT disappear would also be chicken. And then second would be pork. Just like bacon gives a fabulous taste to anything, I live in Spain and am practically surrounded by Serrano ham, which is also great to throw into nearly any dish in cases of emergency, and give a great flavour! PS I love honey and mustard on chicken too. None of this thigh vs. drumstick nonsense. The best part of the chicken is very obviously the wing. Love the simplicity of this. I would choose chicken too! Especially thighs! Well I would agree with the chicken, and definetly thighs!!! Btw, your blog is super! Tied the mochi-bacon yakitoris yesterday, absolutely wonderful! That game sounds like torture, but I would choose seafood (can I choose a whole category?). Love love love this recipe – honey mustard makes everything delicious! Laughing about the foodie version of the “stuck on a desert island with just one book” game! I think I’d choose chicken too, specifically because I love chicken thighs so much. Pinning this recipe to try. Looks and sounds delicious! I love the honey and mustard combo as well. Just bought some chicken thighs this morning so I will be trying this tonight or tomorrow night. Low effort, high impact. Delicious. Baked it in the skillet I browned them in to save a dish. 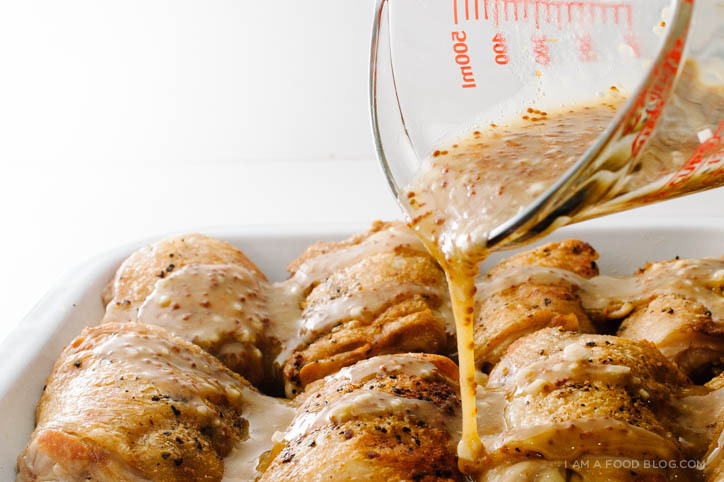 Deliciousness, and I love they almost look like competition style thighs, and per my comment on your Facebook page, I love the cookware ;) I discovered your site this morning and I am drooling! The picture makes my mouth water! I can’t wait to make these — I’m going to do them this weekend!!! I also just discovered your site and the pictures are great. I made these and this is my NEW GO TO thigh recipe!! Delish – thank you! chicken. gotta be chicken. i am a lover of the chicken meat. deep fried chicken wings, deep fried chicken, chicken everything… and recipes like this! made it tonight for my parents, scrumptiously easy delicious, steph! ^__^ i also love chicken thighs…! I guess, we had braised carrots and parsnip with it. I love your measuring cups! Are they enamel? So cute. Congrats on best food blog. I am hooked already! I tried this recipe last weekend & it was great!! My GF was impressed & amazed that it was as good, also. THX!! Sounds great! I’d like to make this using boneless, skinless thighs. Will they dry out in the oven? Anything I should do differently? Love the recipe..I added a little hot pepper and dash of vinager for a little zing. I cooked this and it was great…I did take the skin off and didn’t bother browning the pieces…also thinly sliced the shallots. ..it took 45 min to cook. I served it over rice and I think the lemon and green onions are a must. .
Oh yum! Chicken thighs might be my favorite! Also what side do you think you would go well with this? i like nestling them together because the sides stay juicy, but i don’t think there would be a problem if they weren’t touching – just make sure you keep an eye on them so they don’t dry out. as a side, i think this salad or these sprouts would go well. these potatoes or these potatoes would be awesome as well! Hi! My husband and I have made this several times, and it is a fave! However, the sauce tends to end up really runny after the chicken is done baking. Is there something I can do to thicken up the sauce? 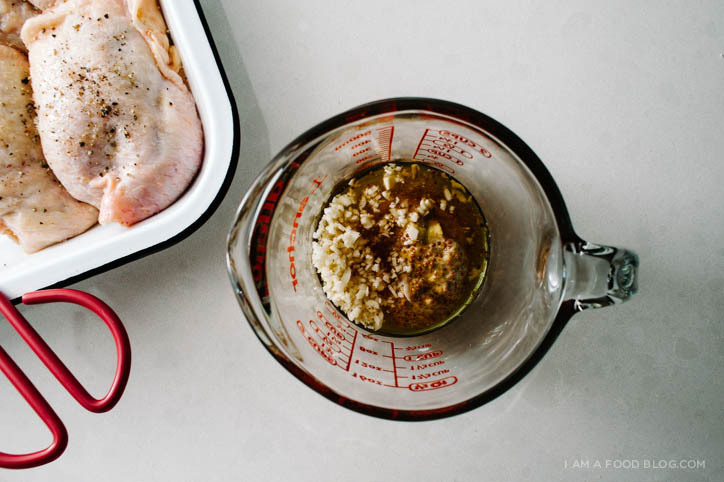 you could try whisking in a tablespoon of flour or cornstarch when mixing up the marinade. alternatively, could also cook the marinade down a bit before putting it on the chicken. just reduce it in a pan until it’s a bit thick. hope that helps! I have made this recipe so many times, and it’s always a family favorite. Have you ever had smoked maple syrup? I know a person who’s family does that, and she gave me some. I used it tonight in this recipe and it was good. Thank you for always putting out good recipes. Really good. On the family rotation. 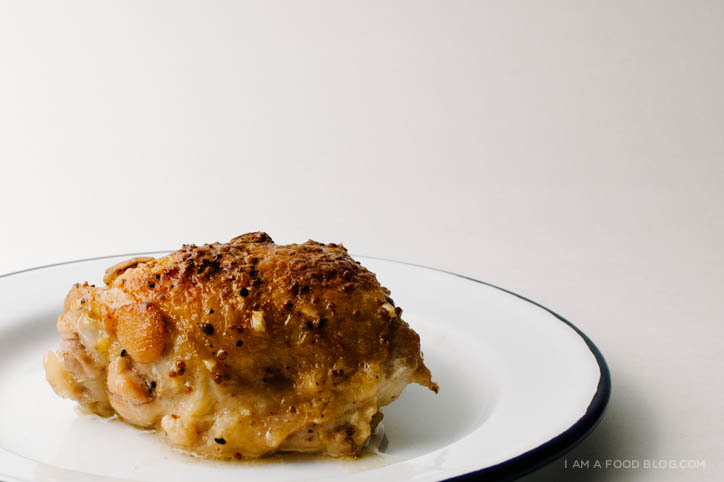 It’s like a delicious large honey chicken wing but more flavourful. I basted several times during the cooking process. Also, I served with store bought bacon/cheddar mashed cauliflower and broccoli – great dinner!